The OP’s question was answered in the first responce by a member with more knowledge than you or me combined. Now go back and review the thread. At post 17 it got hijack by the normal crew and deteriorated from there constantly getting bumped with its not raining then its fine comments. There are plenty of other threads in regards to stops one could choose to post on. What you should care about is how you trade your charts. Pay no attention to these posters on BP… they have very little actual content to add to their insults. If the system above works for you, demo it, if it doesn’t work… maybe take some ideas from the thread. At the end of the day a SL, despite its name and perhaps incorrectly marketed meaning, is just a market order. If there is little or no liquidity at the SL level then it wont get filled at that level. It’s just a back-up, but certainly not guaranteed at all. The OP started this thread over 10 months ago… the conversation had moved on… my post(s) offered an alternative to the issues mentioned in the 2 posts above (and others), 5 - 7 months after the OP’s original post. I’m wondering why on earth anyone would want a stop-loss to operate under those circumstances ? A mechanism such as the Futures market perhaps? - they have equity ‘circuit breakers’ when price moves 5% over night. Normal trading hours include 7%, 13% and 20% down limits. 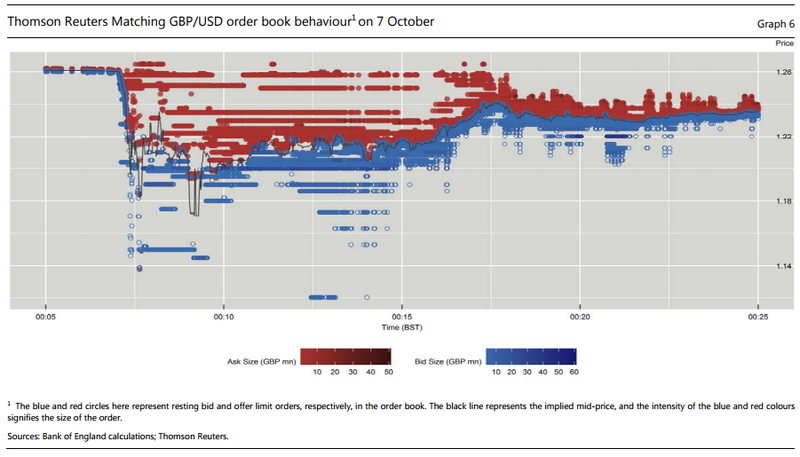 (a) 00:07:15 BST: sharp price movements over a two-second window trigger a velocity logic event which pauses trading on the CME for 10 seconds. (b) 00:07:29 BST: the futures price reaches its lower limit of 122.17 (based on the change on the day). The exchange remains open, but transactions cannot take place below this price on the CME. A two-minute monitoring period begins. halt is triggered on the CME. At 00:11:29 BST, the exchange reopens with a new (lower) price limit. Sources: Bank of England calculations; CME; Bloomberg. The above chart shows a 9% flash crash during the early Asian session. I’ve always been a fan of applying a 5% circuit breaker in FX - but we know this just isn’t possible, not to mention the fact that FX is not a centralized market. So yes, I would most certainly want to use a SL in this case, regardless of it being honored (which it wouldn’t be in this case) - lets at least try to minimize the hemorrhage of bleeding? The below report may be of some interest from the Bank of International Settlement (BIS). It clearly illustrates how no SL would have been honored due to an outrageous decline in market liquidity. Ironically as retail traders we don’t even hit the real underlying market, we just bet against the broker, but I can also bet your last dollar that the MM brokers would mirror the LPs. I’m not accusing anybody of anything. Except perhaps the scalpers who went broke already, and I’m happy to accuse them of ignorance of risk. As for negative posts, every post can be seen in a negative way but I’ve certainly tried to post positive info that I have gleaned from my own experience trading. Anyway, I’m Tom, who are you calling Bob? Except perhaps the scalpers who went broke already, and I’m happy to accuse them of ignorance of risk. I’m happy to accuse the swing traders who went broke already of that, too. You’re right as far as retail trading’s concerned, of course; but most retail traders are losers anyway. If you look at a successful group of traders, such as “institutional traders” earning fat salaries and fatter bonuses, you’ll actually find a pretty high proportion of scalpers. But what many people here describe as “scalping” actually has nothing to do with scalping, anyway. Yes I realise the everyday use of “scalping” has drifted but that’s the popular use so I’m happy to not be too picky over it. Of course,m you might say most retail traders go broke whatever they do. But I say they mostly go broke BECAUSE they’re daytrading / scalping. The article highlights the absolute exposure to the markets that the simple retail trader risks. When an event like this occurs, traders can be left owing more funds than they had available in their accounts, some lose $1000’s… some lose even more. A Stop Loss won’t save you in a situation like this, nor will any open or close point on an oscillating indicator. Zero balance account protection (offered by some brokers) is really the only way to minimise losses as long as you have enough margin to comfortably cover your lot sizes in your trading account. A daily/weekly withdrawal regime can be used to keep your account at a predetermined level. So if a situation like the unpegging of the Swiss Franc transpired again, the traders only exposure is their account balance. Absolutely - And I think this is the middle ground that we all need to understand, far to often new traders and moderate traders still have the assumption that Stops will be honored within a narrow range. I’ve been at this game since 2008, and the thought of being ‘caught’ on the unfavorable side of a flash crash is always concerning - even if you risk 0.5% or less of your account on a single trade it’s going to wipe you out. I guess the next question is “what can one do to limit the risk of these black swan events”, or do we just price this into the game of FX speculation and accept. - if anything… food for thought! When you look at the flash crash mentioned in more detail you would realize that the previous days low was broken in normal trading conditions, therefore a SL placed on this assumption (which is by far the most popular approach when swing or intraday trading) would be honored and a you would have avoided loosing you shirt. Some people put their stops as you say - others put them below the previous swing low, some below the penultimate prior swing low and still others, outside the current trading range. Are you saying that ANY stop placed in teh market would have been honoured, or just “selected ones” ? Not at all, but the previous days low, and previous swing were within or above 1.2250, which according to the below chart had a healthy balance of bid/ask orders - it’s below this point where liquidity becomes intermittent. Ergo - a stop loss will NOT protect you against catastrophic loss. All it will do is ensure that the broker gets paid when the price breaks the level he can see on the screen - N’est ce pas ? Luck really doesn’t come into it, if you’re placing a stop so wide that you are open to the exposure of the flash crash then you need to evaluate the trading approach which you are using. The only traders/speculators that ‘should’ have been harmed in the above event would have been long term positions, which as logic implies is the minority of retail traders? This isn’t an opinion, it’s proven in the chart and the report that was issued. Yes? And this is the point of any SL, regardless of the situation when dealing with a retail MM broker - just like the margin call you would have received.